Why are you reading this blog? Why aren’t you on Forum’s website right now buying tickets to both parts of Angels in America? Perhaps you’ve already seen it, and are here to celebrate with me all that is glorious about the production(s). Repeat after me: the cast! the script! the direction! the technical design! Forum Theatre is giving DCers a wonderful opportunity to see both plays in rep. More often than not, Angels in America Part I: Millennium Approaches is performed alone. And you can see why. If you are only going to do one part, the first one is the one that makes the most sense alone. But to only see Millennium Approaches is really to miss out on the epic work which playwright Tony Kushner wrote. There are three main plots woven through the story. In the main one, we meet Prior Walter (Karl Miller) a gay man who has just become ill with complications from AIDS. His lover, Louis Ironson (Alexander Strain) leaves him, unable to cope with the pain of watching Prior die. The relationship of Mormon couple Joe Pitt (Daniel Eichner) and Harper Pitt (Casie Platt) is also under strain. Harper is not quite mentally balanced, caused partly because the young wife knows deep down that her husband is a closeted homosexual. In the third plot, Kushner uses real life attorney Roy Cohn (Jim Jorgensen). Cohn was a conservative, powerful lawyer well known for his work on anti-communist cases during McCarthy’s investigations. In Angels in America, we meet him as he is dying of AIDS, knowingly deceiving himself and insisting all the while that it is liver cancer. Prior refuses to stand still for himself and for humanity. And the other characters, through their journeys, make the same decision. Harper, who has spent much of the play in a drugged haze, is able to finally gather her strength and leave her husband. All she has wanted was to get him back, and when he does come back, she realizes that she can’t have it the way it was; she cannot stand still; she must move forward. Louis faces his demons, and stops running. He too finds the strength needed to love Prior, and though their relationship cannot be what it once was, a new one is forged. Under the smart direction of Jeremy Skidmore and Michael Dove and the talents of the cast, this production of Angels in America showcases everything that is great about the play. 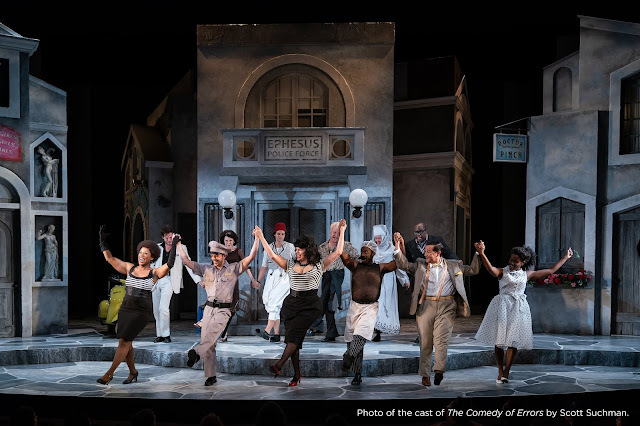 Signature Theater in New York will be reviving this work off-Boadway next season, but I can assure you, they will not be able to assemble a cast that does more justice to the text than the one you can see right now at the Round House in Silver Spring. The two evenings are anchored by the phenomenal performance of Karl Miller as Prior Walter. Miller is delightfully sarcastic, dying and yet full of life, noble and dignified, strong and weak, funny, endearing, and touching. Alexander Strain as Louis and Casie Platt as Harper have the difficult job of playing characters that would come across in a lesser actor’s hands as weak, whiney, and annoying. Strain and Platt never fall into this trap; they are real and sympathetic, and when Louis and Harper finally find their own strength, we are with them. Jennifer Mendenhall also gives fine performances (no surprise there), especially as Hannah Pitt and Ethel Rosenberg. As Hannah, Joe’s mother, Mendenhall is full of subtly expressed, but deeply felt emotion. And she is wickedly delightful as the ghost of Rosenberg, who comes to joy in the death and defeat of Roy Cohn. I saw part two about two weeks after part one, and it was wonderful to see a couple of actors grow and settle more deeply into their parts. When I saw part one, I found Jim Jorgensen as Roy Cohn and Daniel Eichner as Joe Pitt good, but slightly flat compared to the other actors. But both revealed more depth and color in part two, giving fine performances. Really these productions have excellent work all around. So go see them. If I may, I shall borrow the capslock briefly from my blogging compatriot. GO SEE THEM. I would like to learn some great stuff here.